The ADA Restroom Trailer +2 Station Sanibel Series features a designer interior complete with coordinating accents! 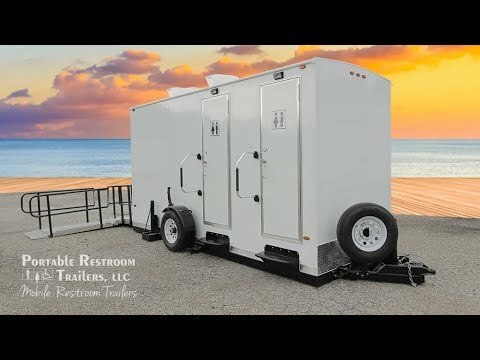 This ADA Restroom Trailer features 2 standard unisex suites, and 1 ADA suite, which can accommodate disabled users and can also be utilized as a family suite. Each standard unisex suite contains 1 pedal flush china toilet, shower stall, pedestal sink, and mirror. The ADA-compliant unisex suite includes 1 wheelchair-accessible shower, sink, grab rails, and ADA toilet with mounted push button control module. This trailer features a hydraulic lift system allows the entire restroom trailer and ramp to lower to the ground with the push of a button!